The night was driven by football. ABC: AMERICA’S FUNNIEST HOME VIDEOS gained 0.1 to 0.9, but DANCING WITH THE STARS JR (0.6) and SHARK TANK (0.7) each lost 0.1, the latter followed by a rerun at 0.5. CBS: Comparisons are to November 11, the last time the network had the late afternoon national NFL game. 60 MINUTES was up 0.1 to 2.1, GOD FRIENDED ME held at 1.0, NCIS: LA rose 0.1 to 0.9, and MADAM SECRETARY remained at 0.6. FOX: Similarly, comparisons are to November 11. After a 0.4/0.5 hour of reruns, THE SIMPSONS was steady at 0.9, and BOB’S BURGERS dropped 0.1 to 0.9. 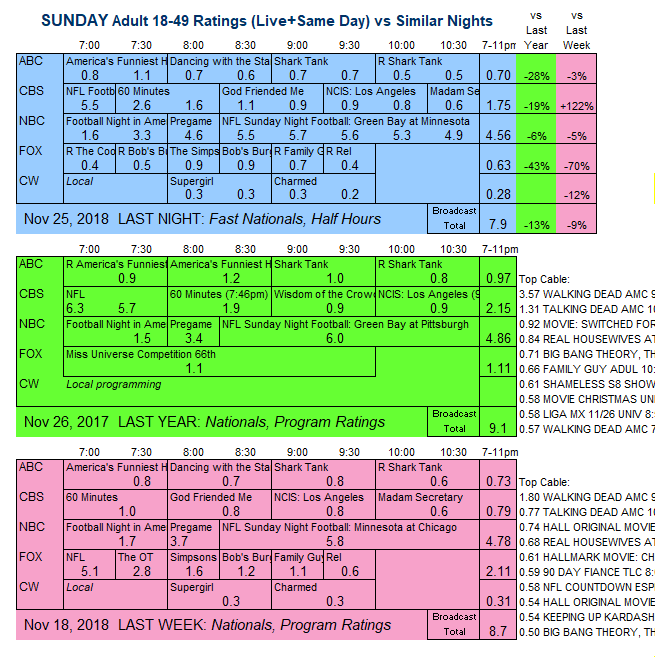 Another hour of reruns followed at 0.7/0.4. 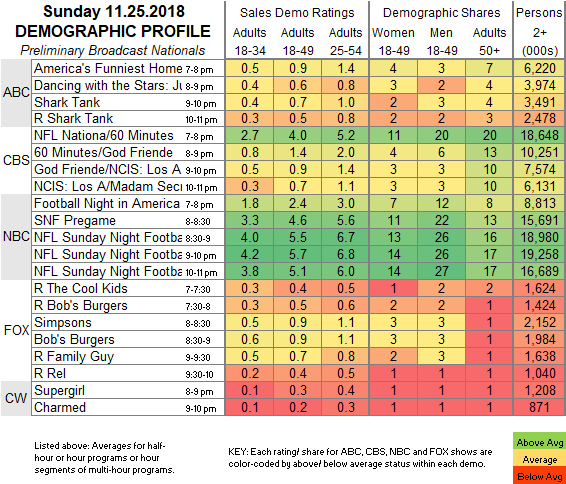 CW: SUPERGIRL stayed at 0.3, but CHARMED fell 0.1 to a new low 0.2. NBC: The preliminary 5.4 for SUNDAY NIGHT FOOTBALL was up 0.1 from last week’s early number. Tonight, ABC brings back THE GREAT CHRISTMAS LIGHT FIGHT for the holiday season. CABLE RATINGS: Come back Wednesday morning for detailed demographic ratings for programs from this day, later than usual due to the long holiday weekend.